PIPED IN by Bryce McCulloch, About a Scottish Highland bagpiper or piper as we call them. My name is Bryce McCulloch and I have played the Scottish Highland Bagpipes for over 30 years. 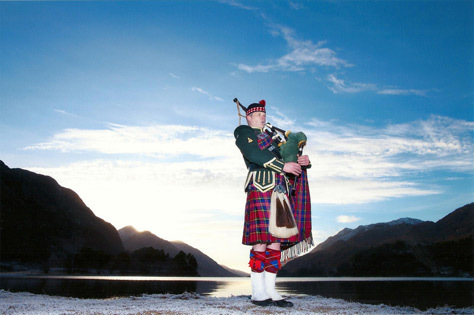 I play the highland bagpipes because I love the instrument and wish to share its Scottish music culture and traditions to as many people as possible. In my early 20s I wished that I had persevered with my school violin music lessons; but after some grief from my friends, regretfully, I dropped the music lessons. I was about to begin the violin again when, out of the blue, my brother Gordon gave me a highland bagpipe practice chanter as a Christmas present. I did not look back. It was the best present I ever received. I practiced for hours each night and eventually joined my local band, Maybole Pipe Band. After I was confident with my playing in the band and comfortable with an audience I slowly developed my solo piping career. Since those early days I have developed into a good steady piper, (not my words), with both Solo piping and Band piping experience. I concentrate my playing as a Solo Piper although I played with the Maybole Pipe Band at the beginning. After five years band experience I was offered the Resident wedding piper at Culzean Castle Ayrshire, Scotland and through word of mouth enquiries and hotel recommendations I keep busy piping at Weddings, Funerals, Dinners, Burns Suppers and events where people require the sound of the Scottish highland bagpipes. I have been resident piper at Trump Turnberry Resort and Golf courses for over 10 years. Over the years I have played at over 1300 weddings. In September 2008 I was nominated for the VOWS award to the wedding industry. I also play the Scottish Small Pipes, a traditional lowland pipe that has recently become more popular due to the array of new tunes written especially for it. The sound of this instrument is ideally suited to indoor entertainment and blends in well with other instruments like violin, guitar, accordion and Clarsach. This is a discipline that I would like to develop further as it is a rediscovered instrument well suited to modern day traditional entertainment. Wedding & Funeral LOCATIONS: Airdrie, Alloway, Ardrossan, Ayr, Ayrshire, Balloch, Banknock, Bishopbriggs, Bothwell, Bearsden, BLANTYRE, Cambuslang, Cardonald, Coatbridge, Cumbria, Cumbernauld, Cumnock, Drymen, Dumfries, Dunblane, Dundee, East Kilbride, Edinburgh, Fintry, Girvan, Glasgow, Gourock, Greenock, Hamilton, Irvine, Kilmarnock, Largs, Loch Lomond, Melrose, Milngavie, Motherwell, Paisley, Perth, Penrith, Port Glasgow, Port Patrick, Renfrew, Rutherglen, Seamill, StevensTon, Stranraer, Strathblane, Stirling, Troon, Turnberry, West Kilbride, Wishaw, Yorkshire.